Kamal Nath is one of the few surviving Congress leaders who were once close to Sanjay Gandhi (Nath and Sanjay were Doon School buddies) and is part of the inner circle of the Nehru-Gandhi dynasty. He was once even referred to as her third son by Indira Gandhi. A scion of a business family from Kanpur, Nath has somehow transplanted himself politically to Chhindwara in MP and been a constant presence in Lok Sabha since 1980. Nath is a multi-millionare and was the richest MP in 15th Lok Sabha. An acknowledged lobbyist and backroom political manipulator, he has manoeuvred himself into various Union ministerial positions in all Congress governments since 1991, and was instrumental in the establishment of Sonia Gandhi as Congress president in the year 2000. Just last week, he was appointed as the Chief Minister of MP. 1.) Kamal Nath is accused of leading a murderous mob which killed Sikhs in the 1984 Congress-orchestrated anti-Sikh pogrom following the assassination of then PM Indira Gandhi. The first real probe into the 1984 pogrom was carried out during the Vajpayee government when the Nanavati Commission was set up. But the investigation and prosecution was again put on the back burner during the Congress-led UPA 1 & 2 regimes. In 2013, a trial court dismissed the case against Congress leaders. In 2015, the Modi government set up an SIT to reopen the cases, and CBI challenged the trial court’s acquittal. As a result, senior Congress leader & ex-MP Sajjan Kumar and former Congress councillor Balwan Khokhar were among 4 people sentenced to life imprisonment earlier this week by Delhi High Court for their role in the pogrom. 2 others were sentenced to 10 years in prison. ” Having spent two hours with the mob in front of Rakabganj Gurdwara, having done nothing to help the two Sikhs lying in a critical condition, having allowed the mob and the police to carry on with their hostilities against the targeted community, Kamal Nath was clearly part of the problem, not the solution. The unanswered questions about his role in the Rakabganj Gurdwara episode might well hold the key to uncovering the high-level conspiracy behind the 1984 carnage. 2.) 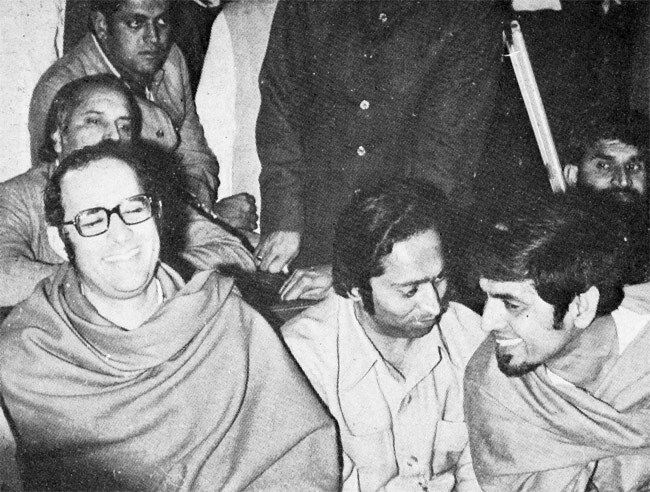 A key acolyte of Sanjay Gandhi, Nath played a major role in the draconian Emergency era which led to the slogan “Indira ke do haath, Sanjay Gandhi aur Kamal Nath”. (Indira has two hands – Sanjay Gandhi and Kamal Nath). 3.) Sanjay Gandhi, with assistance form Kamal Nath, created the Frankenstein called Bhinderwale. They decided to create a ‘Sant’ (saint) to counter Akalis in Punjab. Sanjay & Nath interviewed prospects & zeroed down upon Bhinderwale, whom they paid to carry out their agenda. Bhinderwale went on to found the separatist Khalistan movement with support from Pakistan, leading to the Golden Temple siege and subsequent spiral of terrorism in Punjab. 4.) Kamal Nath had the reputation of being a corrupt minister who ‘gets things done’ in UPA. Tarun Das, head of CII, was caught on Radia tapes saying that ‘‘Kamal Nath Is A Doer. He Can Make His 15 Per Cent, And Do National Service’ while discussing Nath’s appointment as Minister for surface transport and highways. 5.) Kamal Nath was heading the Commerce and Industry ministry when the Rs 2,500-crore rice export scam of 2008-09 broke. 6.) Nath was managing director of his family-owned Electrical Manufacturing Company (EMC), Kolkata in 1979, when it was found guilty of corruption in the 70s – Kamal Nath used political contacts to get orders from West Bengal electricity board. He even used muscle power to disrupt an inquiry commission set up to investigate the case. The inquiry commission gave a sordid account of corruption and favouritism in the case. But the matter died out after Nath gave West Bengal CM Jyoti Basu’s nephew, Tapas Basu, a job in his company. EMC was ordered to shut down by West Bengal pollution control board in 2001. 7.) According to Wikileaks, Kamal Nath told American diplomats in 1976 that India plans to detonate a second nuclear device. They dismissed him as brash and boastful. 8.) Arun Shourie & S. Gurumurthy had accused Nath’s companies of having illegal foreign bank accounts in Dubai and Riyadh in the 80s. Nath’s offices and home were raided by the Enforcement Directorate in 1985, but the raids were later called off. 9.) Nath was charge-sheeted in the Jain Hawala corruption case in the 90s, and discharged in 2013. A host of other Congress leaders – Balram Jakhar, V.C. Shukla, Madhavrao Scindia, R.K. Dhawan, Bhajan Lal, Rajesh Pilot, Buta Singh etc were also named in this case. Denied a Congress ticket in 1996 because of the Jain Hawala case, he induced the party to nominate his wife Alka by threatening to stand as an Independent. 10.) In 1990, Span Motels Private Limited, a company with direct links to Nath’s family, encroached upon forest land in Himachal Pradesh to set up a resort. This encroachment was regularised in 1994 when Nath was the Union Forest and Environment minister. The company also changed the course of the Beas river which witnessed extraordinary flooding in 1995. In the M.C.Mehta v. Kamal Nath and Others case, Supreme Court ruled against Span Motels and ordered the Government to restore the area to its natural condition. 11.) In 1995, customs officer R. Shakuntala was transferred 3 days after she incurred the wrath of Union Minister Kamal Nath when his entourage was subjected to a baggage check at IGI airport and asked to pay a duty of Rs 1.25 lakh for imported luxury goods. When a medieval bawdi (water tank) was discovered in his farmhouse in South Delhi, officials of the Archaeological Survey of India were initially denied access to the site. 12.) Kamal Nath’s sister is married to Deepak Puri, promoter of now bankrupt Moser Baer company which defaulted on creditor’s claims of Rs. 4,828 crore. 13.) For once, Nath chose to be a whistle-blower to prevent a scam. After the 2014 LS elections, former CAG Vinod Rai revealed that Kamal Nath had sent a letter to then PM Manmohan Singh warning him about the 2G scam. Admitting to this, Nath told a TV channel it was ‘unfortunate’ that the former PM ‘chose not to act’ on his letter. But even while throwing his former PM under the bus, Nath demonstrated his fierce loyalty to the Nehru-Gandhi family by terming as ‘absurd’ all charges against party supremo Sonia Gandhi in the 2G scam. 14.) Today, Kamal Nath and his immediate family, wife Alka and sons Nakul and Bakul, have a diversified business empire with interests ranging from real estate to aviation and from plantations to hospitality. Despite the much-hyped generational change & youth power that is supposedly the calling card of Congress President Rahul Gandhi (48), it is instructive that a septuagenarian family loyalist mired in controversy has been preferred over the much younger Jyotiraditya Scindia (47) in MP. With Congress, the more things (appear to) change, the more they remain the same.